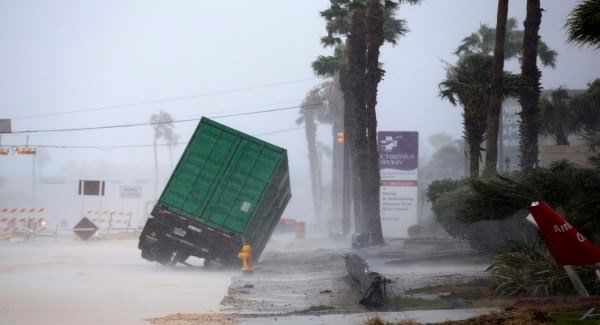 The fiercest hurricane to hit the US in more than a decade came ashore late on Friday about 30 miles northeast of Corpus Christi as a mammoth Category 4 storm with 130mph winds. It weakened overnight to Category 1. But the storm’s most destructive powers were just beginning. Rainfall that will continue for days could dump more than one metre of water and inundate many communities, including dangerously flood-prone Houston, the nation’s fourth-largest city. “Our focus is shifting to the extreme and potentially historic levels of flooding that we could see,” said Eric Blake, a specialist at the National Hurricane Center in Miami. No deaths were immediately reported. High winds kept emergency crews out of many places, while authorities said it could be hours before emergency teams are able to fully assess damage. By dawn, nearly 300,000 consumers were without power in the coastal region, and nearly half a metre of rain had fallen in some places. The mayor of Rockport, a coastal city of about 10,000 that was directly in the storm’s path, said his community took a blow “right on the nose” that left “widespread devastation”, including homes, businesses and schools that were heavily damaged. Some structures were destroyed. Mayor Charles Wax told The Weather Channel that the city’s emergency response system had been hampered by the loss of mobile phone service and other forms of communication. About 10 people were taken to the county jail for treatment after the roof of a senior housing complex collapsed, television station KIII reported. In the storm’s immediate aftermath, the Coast Guard sent two helicopters to try to rescue the crews of three tugboats reported in distress in a channel near Port Aransas. About 4,500 inmates were evacuated from three state prisons in Brazoria County south of Houston because the nearby Brazos River is rising from Hurricane Harvey’s heavy rain. By late morning, Harvey’s maximum sustained winds had fallen to about 75mph and the storm was centred about 25 miles west of Victoria, Texas. It was moving north at 2mph, according to the hurricane centre. The system was expected to become tropical storm by Saturday afternoon. The National Hurricane Centre later downgraded Harvey from a Category 1 hurricane to a tropical storm. But officials say they are still worried about potentially catastrophic rainfall that will continue for days, with more than 40 inches and flash flooding possible even well inland. Texas Governor Greg Abbott said there were no confirmed deaths linked to Harvey. At a news conference in Austin he said he was working with local officials and seeking information about the storm, but that there’s nothing yet confirming that it killed anyone. The White House said Mr Trump has met with his Cabinet and other senior administration officials to discuss the federal response to the flooding and damage caused by Harvey. It issued a statement saying that Mr Trump held a video conference from Camp David in which he instructed the relevant departments and agencies to “stay fully engaged and positioned to support his number one priority of saving lives”.